Castlevania: Portrait of Ruin is the second Castlevania game on Nintendo DS, featuring a dual character system, multiple locations, and many RPG elements. You play as Jonathan Morris and Charlotte Aulin - the former being the son of the John Morris, who is one of the protagonists of Castlevania: Bloodlines - who arrived at Dracula’s castle to confront a vampire named Brauner and his daughters Stella and Loretta. You soon met Eric Lecarde, the other protagonist of Castlevania: Bloodlines, who tell you about the castle, the sisters, the Vampier Killer, and what you need to do. Portrait of Ruin features a dual character system. Rather than just switching from one to the other at any given moment (as in previous games), Jonathan and Charlotte have the ability to work together at the same time. While you control one character, you can call on the other character to attack, cast spells, stand in place (so you can move him/her or jump on top), help push an obstacle, or perform a “Dual Crush” attack. Jonathan plays like a traditional vampire hunter, and Charlotte is more like a mage, so the game affords different playstyles. The ability to call on the other character also give rise to some interesting puzzles. The “Dual Crush” attack is basically a very strong special attack, ranging from summoning volcano to a full screen meteor attack - which are all fun to use and very useful if you need to deal massive amount of damage. The other departure from previous games in the series is the world design. Since Symphony of the Night, games in the Castlevania series mostly feature one large map (basically the whole of Dracula’s Castle), with maybe a second map for the final showdown with Dracula. 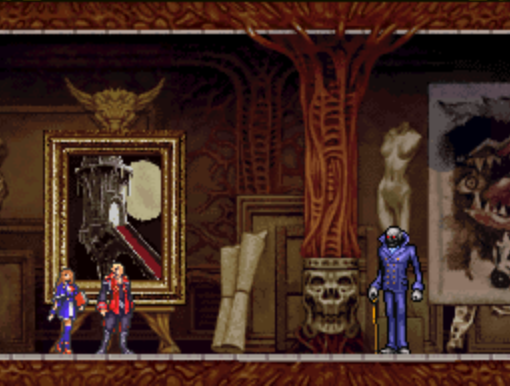 On the other hand, Portrait of Ruin features 8 individual zones that represent painted worlds possessed by Brauner, and are only connected to the main castle through singular access points. This gives the game a very different feel, as there are few reasons to revisit any of these zones once you finished with it. Neither Jonathan nor Charlotte can collect Tactical Souls from enemies, but there are still 29 subweapons, 41 spells, 10 Dual Crush skills, and many equipment to collect. Spells are used by Charlotte, and subweapons are used by Jonathan - the latter can also accumulate XP and turned into upgraded versions of itself. There is a shop run by an NPC called Vincent, but the more interesting NPC is still Eric, who gives you many quests throughout the game and reward you with unique abilities and equipment. Sometimes he wants a particular item, but sometimes he just wants you to kill a particular enemy, or kill 3,000 enemies. In a way, this makes Portrait of Ruin the most RPG castlevania has ever been, with plenty to grind (for money, for random drops, for quests, or for levelling up) if one is so inclined. Castlevania: Portrait of Ruin is best when incorporating the dual character system. Switching from one character to the other and call on each other to help is very satisfying. Combat is as fluid as ever, and all the subweapons, spells and Dual Crush makes combat even more fun. I personally enjoy the RPG aspect (partly because I am not very skilled), but even if you do not, you can still fight through everything. Highly recommended.